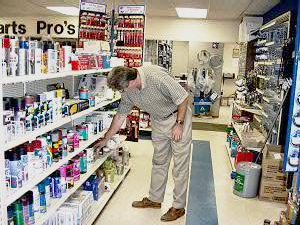 BEEN TO THE AUTO PARTS STORE LATELY? NOTICED ALL THE DIFFERENT CANS OF PRODUCTS FOR AC SERVICE? Are you as CONFUSED as everyone else? 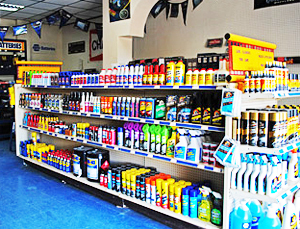 Why carry five or more different AC additives, treatments or dyes, at all different prices and from a half dozen different vendors? Wouldn't you really love to have just ONE single treatment, ONE product that does it all? You owe it to your customers and your company's bottom line, to bring this program to your shop and their attention. It saves everyone money and time... plus it's so easy to sell and install this service. Fact: No product on the market can do all of these things... especially with just one SKU. All we ask is that you honestly check out ALL the AC treatments available to your shop. First thing you will notice... There are dozens of them available to the AC service industry. Now look at all their claims, you will see twice as many more! WHICH ONE WORKS? WHICH ONE IS SAFE? SHOULD YOU ADD 3 OR 4 TOGETHER, TO GET ALL THE FEATURES YOU WANT OR NEED? Fortunately GWR has made it simple for you to decide. all at a price that's as much as 5 times less expensive than some competitors. your finger tips because it's on your shelf... not at the auto parts store. The "ONLY" Total AC Conditioning Treatment! IT IS "NOT" ACTIVATED BY REFRIGERANT "AFTER" IT'S INSTALLED! 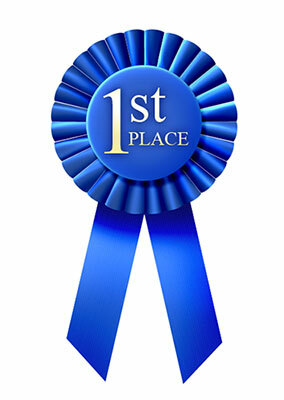 have voted us #1 Worldwide! Our unique additives lubricate all moving metal parts in an AC system, while revitalizing O-ring and seal elasticity. More remarkably though, they seal hard to find leaks in evaporators, condensers, hoses and other difficult to repair AC components. Additionally it helps to keep the lines and compressor clean by preventing acid formation that leads to oxidation. It has the ability to control humidity also, special oils modify moisture so that it does not retain damaging properties. By controlling all these detrimental components, we lower vent temperatures, extend life of system and even improve cabin comfort levels. Don't spend hundred or even thousands to replace expensive parts only to find out you missed a small pin hole elsewhere and now all the new gas has leaked out. TOTAL REJUVENATION OF A SYSTEM! CLEANS BOTH SIDES OF THE CLOSED LOOP CIRCUIT, FOR TOTAL PERFORMANCE AND EXTENDED LIFE! 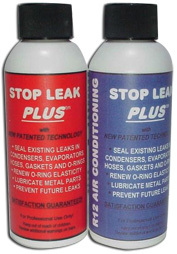 Stop Leak Plus can be use as a tune-up "conditioner" during a maintenance refrigerant top-off when components are in overall good shape, or as a complete system rejuvenator when new gas and oil are added during a major repair or service. It is especially important to put a few ounces into all new vehicles also. Programs are available for all levels of distribution to professional technicians, from single cases for automotive applications to gallon containers for commercial HVAC use. We even offer the specialized tools needed for installation, you can see more about them on additional pages and the FAQ section. GWR Stop Leak Plus is not activated by air, moisture or refrigeration gases like the common products found at the Auto Parts or HVAC supply store! It is "not" polymer based and will not harden... ever! It simply remains as a base oil in the system after installation and "never" converts like the problematic "hardening" type sealants. pressurized metal can, do not use it! No questions ask, period, end of story! Here is the problem.... All of them set by moisture or gas contact and that means they will clog a system and or recycling machine once they touch air inside the unit. Watch out for the words "Inert", "Activated", or "Forms a Chemical Weld", as these phrases are a dead give away that product inside is a polymer! After Super Seal installed, system failed due to damaged compressor and system clogs. to see on the internet and at auto parts stores? Aren't they the same as ACT Stop Leak Plus? Patented AC Stop Leak Plus Conditioner! Ones that look like liquid (red, yellow, white, etc) are mineral oil based and have zero solids (the seal swellers type), or they contain powdered calcium or silicate solids that stick together and form large blobs of floating debris in a system. As you may be able to visualize, neither idea is good! They will either weaken rubber parts, have no effect at all, or the larger particles will clog the filters, orifices, capillary tubes and other parts of the AC System. direct from Amazon's and Advanced Auto Parts websites. Bought this and put it in a Chrysler Town and Country. 2 weeks later it no longer cools, the refrigerant leaked out. This was slightly slower than without the sealant. The product is supposed to seal leaks this slow. The leak is in the evaporator which I was hoping to keep from replacing. Too bad, I really had hoped it would work. Now I'm left to try and get my money back from the manufacturer, I guess. 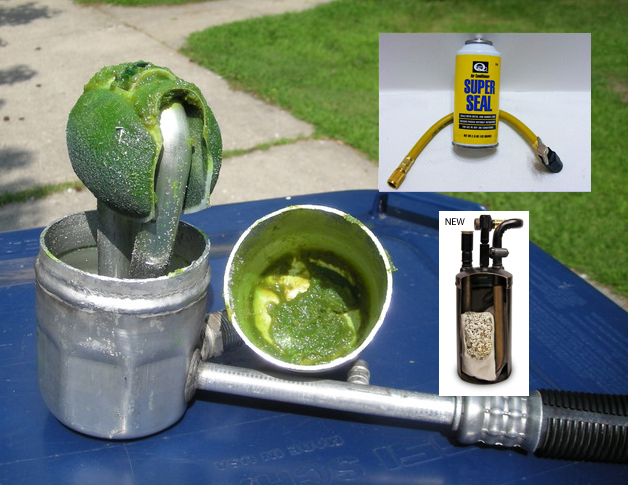 I have been in the auto repair business for over 40 years and was always hoping that someone would perfect a liquid stop leak for automobile a/c When I opened the first bottle all of the ingredient were settled and stuck in the bottom of the bottle, the remainder of the bottle is pag oil with dye. I opened another bottle same thing I tried to remix the solution no success. I returned the product for a refund This may be a good product if Bars can come up with a way to keep the solution suspended and from settling to the bottom of the bottle. Bars has been around a long long time and I have the utmost confidence in their products but I think this one needs a little more development. Nothing against seller. But I put this stuff in my new F -150 and my AC got hotter. Had to drain it and start over with just regular Freon to get it back to normal. These aren't our words... actual customers are irrefutably defining the problem with purchasing the wrong stop leak or conditioning product. At the least you don't stop the leak and only waste expensive refrigerant... so not a big issue. Or you don't get the effects that you are looking for, so disappointing and a waste of your money. On the other side of the coin... many of these products create a glue or sludge or even sand like rocks (see below), that clog up your entire system. Now you are talking a new compressor, a new evaporator, a new condenser, a new accumulator, a new orifice tube, additional refrigerant and all that wasted labor for a service to replace broken parts. Is it really worth taking a chance with one of the copy cat products? Trust the only product to be on the AC market over 20 years without a single claim for damage, that's zero damage to any systems or piece of equipment! GWR's "AC Stop Leak Plus"
We do not react to moisture and therefore do not come in a sealed pressurized can that are dangerous they sometimes harden while you are trying to do the install. Additionally, our SLP product will not clog installation equipment or the recycling machines needed to remove gasses from systems being serviced. Take a look at this picture and you will see why the products in pressurized can are a nightmare for the AC System, they are likewise a problem for a recycling equipment. 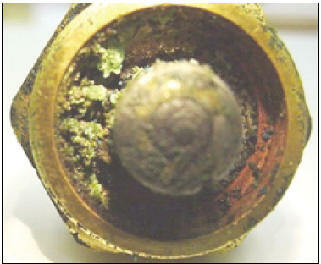 The end view of a solenoid valve from an evacuation machine, notice the hardened particles of another stop leak product. These granular particulate float around in the system until they attach to a part or get trapped in a filter or expansion valve. When that happens, system efficiency is reduced or even stopped and another repair is required to remove the bad sealer and the parts that have been damaged. Three elements are necessary for GWR's Stop Leak Plus to seal leaks.... the Refrigerant, the system pressure and movement velocity. Our unique product physically works with these elements, yet it does not "activate" as all the others. When a leak occurs, whether pre-existing or in the future, refrigerant and some oil escapes through the hole at a rapid rate of speed and a venturi action is created. This high speed flow allows some of the Stop Leak Plus to likewise pull through with the exiting gas. When these escaping micro particulates bombard the ragged edges of the hole some flow through (the ones smaller than hole), while others bounce off (the ones larger than hole). When the exact right size finds its way into the hole, that particle plugs hole like a cork in a bottle, or stopper in a sink. 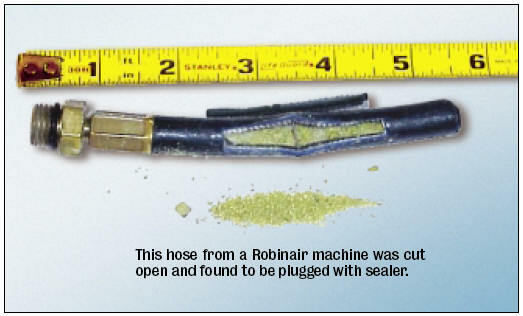 Additionally Stop Leak Plus Micro Particulates were formulated to stay flexible and pliable after the seal is created. They will remain secure through on and off temperature cycles and years of normal engine and driving vibrations. Simply stated... 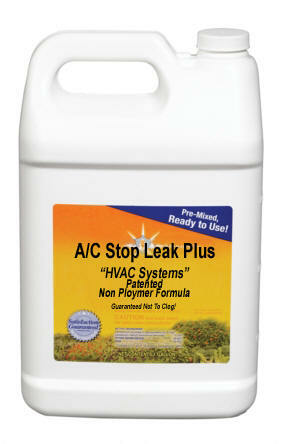 This is the finest A/C Stop Leak / Air Conditioning Treatment on the market! It is sold worldwide and used in millions of units! and eliminate costly service comebacks. It also converts moisture so that it no longer generates corrosion. While this is going on, another oil rehydrates the seals to original size and elasticity. As a final benefit it attaches to interior metal parts to improve thermal transmission, that lowers temperature you actually feel through the vents. Still concerned about using Stop Leak Plus? We believe this expert testimony definitively answers the question everyone with a leak eventually asks. When ask "Will a Stop Leak Sealer cause damage to A/C Systems?" "Since the introduction of AC sealers several years ago, we noticed a drop in evaporator sales but an increase in compressor sales, especially for older vehicles. I attribute that to the fact that a sealer makes an AC job affordable when there is a leaky evaporator and compressor. Since the sealers do a good job on evaporator leaks, but won't seal compressor shaft seals, we are finding customers generally authorize a replacement compressor and the stop leak sealant. In my examination of over 2,000 returned compressors over the years, I have not noticed a significant problem with sealants. In fact, less than ten units showed congealed sealant at all. Upon closer examination, in only a few cases could the congealed sealant be determined to be the cause of the failure. And this was no doubt due to the technician failing to replace the dryer and leaving moisture in the system during servicing. Additionally, in just the last 3 month summer sales season, we sold over 460 compressors and did not receive even a single return due to sealers." Honestly Stop Leak products should not be blamed for the reason failures occur in systems, after they are installed. When we look closely we find problems can be traced to technicians or DIY'ers improperly preparing systems before their installation. The issue is moisture! When a system has not been properly evacuated and a new accumulator (dryer) installed, then polymer sealants are going to harden and clog when they touch that moisture. Obviously no "mechanic in a can" product from the autoparts store is going to remove it effectively, so consumers must stay away from them. Due to DOT / UPS / FEDEX / USPS shipping restrictions on chemicals in general, we do not sell single application bottles of our Super Stop Leak Plus. Likewise, because of time and personnel limitations, we are not able to suggest local shops in your area that install stop leak products. If you need your system to be sealed, we suggest you call local service companies and ask if they have a service available that uses GWR's A/C Stop Leak Plus. Please note that SLP is a professional product and is not intended for DIY consumer installation, special service tools and a thorough working knowledge of A/C repair are required. As such, we "do not" have single application bottles available for Consumers / DIY customers. Before calling us, we suggest you contact a local A/C repair shop for a professional install when you do not have the proper training or the necessary tools. (For more information, please see FAQ's below). please scroll down the page to our FAQ section. SUPER STOP LEAK PLUS tm prevents comebacks, period! That means more profit for installers and no headaches for consumers. GWR’s new SUPER STOP LEAK "Plus" is specifically formulated to prevent leaks and repair existing leaks... while revitalizing gaskets and o-rings with patented lubricates and lowering temperatures with proprietary technology. Because of its liquid consistency, you install it just like standard A/C oil. A technician simply uses an A/C oil injector tool to install through the low side service port but you can also draw it through the center tap on a set of standard manifold gauges, if you prefer. This means the system does not need to be evacuated to use our product, another time saver! Simply start the engine or system, turn the A/C to maximum cooling, install SUPER STOP LEAK "Plus" and recharge the system with R-134A, R-12, R22 or R410A as per the service manual. Make it part of your maintenance service... add SUPER STOP LEAK "Plus" to every A/C service and keep systems at optimum performance levels. so the new refrigerant gas flows through it and carries AC Stop Leak Plus into the system. Note: If someone says installing a Stop Leak will clog up a recycling machine, they honestly don't understand how this works. Because our inline injector (the holder of the SLP) is placed down line of the gages and or recycling equipment (near the low side schrader valve), no Stop Leak every passes through them. Obviously there is no way they would effect anything used to install the safe, non polymer, non hardening liquid. Can a consumer install GWR's Stop Leak Plus? This professional product is not something you can buy at a local auto parts store, or take home for a simple installation. On the other hand, a mechanically inclined person could use the Super Stop Leak Plus if they are familiar with A/C repair and have the required tools necessary to test and install the product correctly. At the very minimum, you will need the oil injector tool used by shops for the last 30 years, to put refrigerant oil into A/C systems. Additionally, you should have a set of manifold gauges and a pump to pull the vacuum for testing leak down time. it is impossible to install GWR's Stop Leak Plus. you must have someone with professional knowledge do the service. These extremely high quality professional tools are available from GWR, starting from the $50 range. Please specify R12 or 134A models or both Note: Actual shipped tool may vary slightly from above pictures. How large a leak will it repair? In general, Super Stop Leak Plus is designed to seal an A/C system that has slow leaks, taking weeks or months to show up. The system must be able to hold a vacuum on the low side for 45 minutes, at a minimum. If the vacuum is lost or changes significantly within an hour, the hole or leak condition is too large to be sealed and manual repairs should be made. Will it seal evaporator leaks? Yes, plus it will also seal leaks in the condenser. Additionally, the special oils will rejuvenate all connection hoses, gaskets and o-rings, lower temperatures and quiet compressor noises. The only part of a system where a leak can not be repaired is a compressor shaft seal, since the parts are moving and not static. All seals are designed in a way that leaks are inevitable, shafts that go through them continually turn at the seal's mating lip. Is it available for both R-134A and R-12 systems? Yes! There is a Super Stop Leak Plus for both R-12 and 134A A/C systems, plus it works with blended refrigerants as well. Be sure to specify either the R-12 or 134A version when dealing with automotive applications, to match system being serviced. 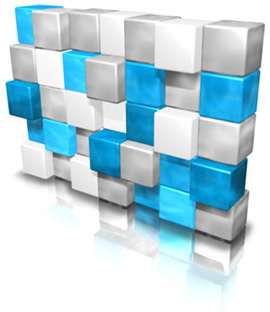 What about commercial or home A/C systems? 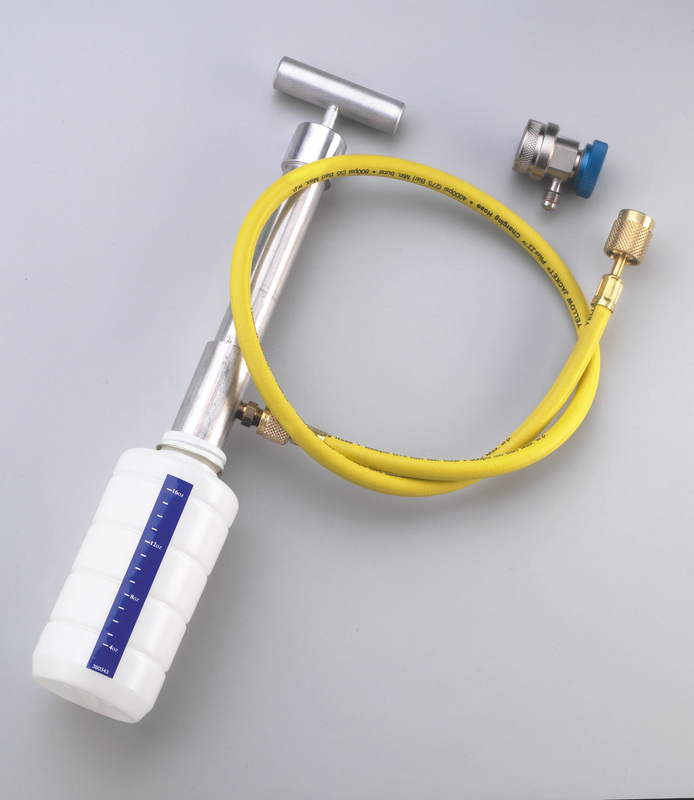 We encourage professional installers to order one of these incredible tools, they are simple and the fastest way to inject our Super Stop Leak Plus additive. 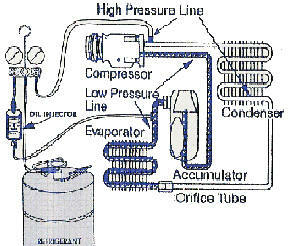 Best of all you don't have to bring down a system, you can inject at full system pressure based on the seal system in the high pressure pump. Additionally, the reservoir bottle holds 16 ounces of SLP, so you do not have to stop and refill (smaller tools) when you need to put 3, 5, 10 or more ounces into one unit. Call GWR Products for price and available. How long will it stay in the system? Super Stop Leak Plus forms a permanent repair when it comes into contact with venturi flow, specific temperatures, pressure, refrigerant and other parameters at one specific location. If there are no leaks in the system and you’re installing it for preventative maintenance, the product simply remains a high quality liquid lubricant until a leak is detected. Every vehicle should have a bottle installed when a major repair is performed but also on systems with no problems. It is the cheapest insurance you can buy! What happens when I recycle the refrigerant? Super Stop Leak Plus is removed from the A/C system with the refrigerant during standard recycling procedures. It separates from the refrigerant during evacuation and joins the reclaimed oil. Since it flows, is an oil and does not harden in a system, it will not harm or clog recycling machines during transitions. How long has the product been on the market? Does it really work? The Super Stop Leak Plus has been sold to the professional installer for over 15 years and installation problems are virtually non existent. The few complaints we have received are always from installers who fail to check over the system before installation of the product. When the holes are just to big or there are too many (will not hold a steady vacuum for 45 minutes), even our unique, patented sealant, may not repair a leaky system. Rely on the best sealer in the business, we guarantee there's not a better one available... anywhere in the world! federal prosecution and adjudicated compensation for damages of punitive and or compensatory nature! Stop leaks such as Supecool's Total Leak Stop, Bar's A/C Stop Leak & Sealer, UView's AC Stop Leak Plus, FJC's Air Conditioning Stop Leak and other less famous brand name products, are unauthorized copies of the patented formula sold by GWR under the name AC Stop Leak Plus and or A.C.T. Likewise, because these copy products do not match the technical specifications of the unique, proprietary formula, they do not have our endorsement or approval. Total Leak Stop, A/C Stop Leak & Sealer, Air Conditioning Stop Leak and AC Stop Leak Plus are trade marks of their respective owners.